It really doesn’t get much better than this assortment. Not only do you get the 2018 Opus 6 Fall assortment, but you also get 3 super rare Arturo Fuente Cigars to go with it. This is the deal to go after for the holidays! Makes for remarkable gift for a loved one, or just to spoil yourself this year! The Opus 6 alone MSRP is $260. 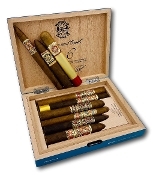 For only $39.99 more you get 3 super rare Arturo Fuente Cigars!